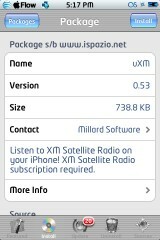 Milliard Software, Maker of uSirius (A mobile Sirius Radio player) has released their new app, titled uXM. uXM requires a membership to XM Radio, just like uSirius. uXM is still in beta, but will still function really smoothly. When you open the app, you will see a login screen, exactly similar to the one of uSirius. On the bottom, there are 2 options: Load Channel Logos and Clear Caches, but you must be logged in to do this. Once you login, you would want to press the Channels button on the top left to start listening. There’s a good variety of channels, with pretty much all types of music. 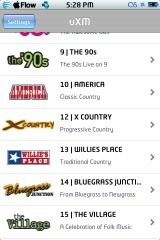 To make navigating easier, you might want to Load Channel Logos. 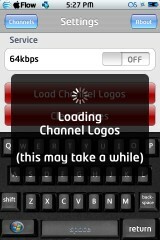 This will give the right channels the right logos they have, though it will take a while (like the pop-up says). To start listening to a channel, tap the channel you want to listen to. 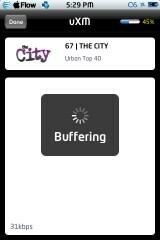 It will start buffering, and take you to a blank screen. At the top right, there’s a little percentage bar. When that reaches 100%, music will start to play. The name of the song playing will show in the big white box. This app does not work in the background, so if you press the home button, music will immediately stop playing, but it will continue playing if you lock the screen. If you press Done at the top left of the screen, it will bring you back to the channel directory, and the music will stop playing. uXM Is available through the Millard Software Source (http://www.millardsoftware.com/iphone.xml). sweet, and the screenshots look so sleek, i guess i did a pretty good job, huh?? i have a 2.5g and i was wondering if the app working through edge/wifi or it doesn’t require a data plan? i’m a bit confused? i’d appreciate a feed back. I can not find the the information of the account, would you guide me I am really interested to use it!